Black Ice Software - Tiff Viewer version 11.32 is released! Tiff Viewer version 11.32 is released! Printing silently from command line, Annotation improvements and Unicode Text file support! 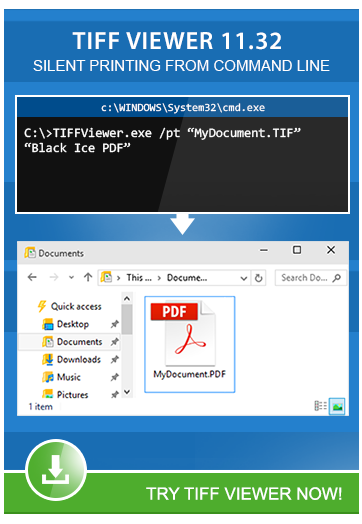 Black Ice Software has released version 11.32 of the Tiff Viewer including new capabilities to print documents silently from a command line to insure compatibility with MODI. By using the command line printing feature, users can print documents and images with the Tiff Viewer more quickly and easily without manually starting the Tiff Viewer and opening the file. The Tiff Viewer version 11.32 comes with improved Note and Text Annotations with optimized font display for a better appearance. The improved Note and Text annotation will always set the most recently used font type to let users create more consistent text annotations. Version 11.32 of the TIFF Viewer includes support for Unicode text files to let users open text (*.TXT) files with eastern (For example: Chinese, Korean, Japanese, Russian) characters. Tiff Viewer version 11.32 also includes improved printing for multipage images with different resolution (DPI) for each page, and minor enhancements in the annotation handling and appearances to improve the user's experience.